You’re all fired up about your future. There’s only one problem: you’re not sure how you’re going to pay for the college education you’ll need in order to realize your aspirations. The good news is that Michigan is currently running a campaign to increase college attendance by 60% by 2025. As part of that campaign, the state has a bounty of resources to help students prepare and plan for college. The Michigan College Access Network has both online and in-school programs to help achieve this goal. What’s even better than that? Maybe the more than $112 million in financial aid available from a variety of sources for Michigan residents. If you’re not sure where to start, don’t stress. We’re going to walk you through everything you need to know to fund your college education. If we’re going to tell you to apply for FAFSA, we should probably also disclose that filling out the application can be a bit of a headache. However, we’ve created a step-by-step guide that should hopefully make the process a little easier. When should you apply for FAFSA? As soon as possible. Some grants and scholarships that are determined through FAFSA may have early deadlines that you’ll need to meet in order to be considered. You certainly don’t want to miss out on free money because you waited too long to apply. While FAFSA will automatically put you in the running for various state grants and scholarships, it’s important to know that it doesn’t cover everything. Some of Michigan’s many state offerings may require a completely separate application. And speaking of Michigan offerings, here are some Michigan grants that you might want to check out. There are also Michigan scholarships to check out. To search for additional scholarships, go to the MI Student Aid website and use their scholarship search tool. You should also check out the financial aid web pages of any schools you’re considering. They can sometimes be a treasure trove of funding info. Sallie Mae's Scholarship Search is yet another helpful resource for scholarship hunting. After you’ve exhausted all of your options for grants, scholarships, and federal loans, you may still find that you don’t have enough money to pay for college. If that’s the case, consider taking out a private loan to make up the difference. Check out our free NitroScore tool to help forecast your loan payments, and to get a score on how easy or hard a loan may be to pay off. 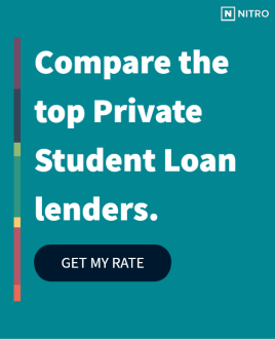 Then, check out our recommendations for the best banks for private student loans. College doesn’t have to be out of reach for any Michigan residents. Start creating your college funding package today.